1. Goto Netflix on your closest computer or mobile device. 3. Tell everyone else politely but firmly to go away. Oh and keep in mind that (to me at least) the show truly hits its stride in Season 2 and that it can be dark at times. Other than that, sit back and enjoy. At this point, you should not keep reading because I’m going to be talking about the show and speculate on the upcoming season. Here’s what I’m pretty sure we know from the previews, Haven is coming back with a bang. I’m serious. I’m watching these previews and clips from the show and I am excited about this upcoming season. The one thing I think that can safely be said is that Mara is here and I cannot wait to see what she brings to the town. The other feeling I have from watching the previews and from the interviews, is the sense that the show has been rejuvenated. Before you go flaming me for saying that, here me out. I don’t think anyone could ever claim the show is predictable or in danger of becoming boring. BUT, with this new super-sized season I feel as if the show has been given an injection of adrenaline or something. 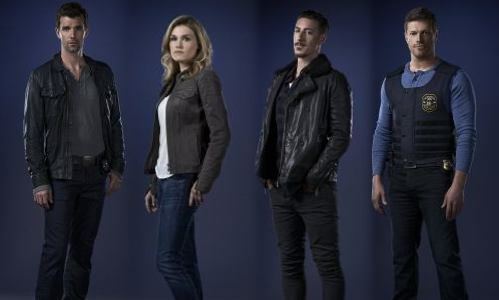 The show has tweaked the trouble-of-the-week formula and there will be a number of double episodes throughout the season. 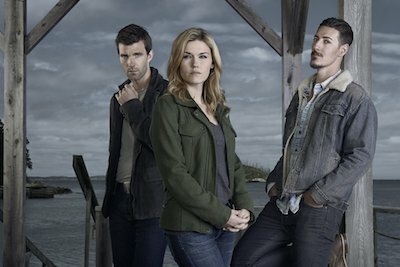 Knowing that there will be (at least) 26 episodes of Haven has changed the writers abilities to tell the story. The possibilities are endless! But now I have so many thoughts going on in my head and I have to get it down so here goes. I can’t wait for the dynamic that the presence of Mara will bring not just for Nathan (obviously) but Duke as well. Duke is/was in love with Jennifer who appears to have died at the end of last season (or she’s taking a long nap). Will Duke hold Mara/Audrey responsible for that? Does Duke write Mara/Audrey off as being gone forever? One thing I enjoyed about season 4 was the growing closeness between Nathan and Duke. I hope we get to see more of them relying on each other especially with Mara/Audrey causing all this trouble. What is the deal with Dave?! He seems to be the only person outside of Mara/Audrey who is not of this world. What does he know and with his revelation, how will it affect Vince? Which of course leads to the question of what will the Guard do now that the creator of the troubles Mara/Audrey is here? The game has changed folks. And look who made the cast photos this year! Dwight!! Adam Copeland has been a gem since joining the show in season 3. We’ll have to see what steps he’s going to take to protect the town from Mara/Audrey. It will be doubly interesting because his two trouble solvers seems to be either distracted or unavailable. I think it’s pretty safe to say that Mara/Audrey does not want to help the troubled, especially if the s4 comic book is anything to go by. Then you have Nathan who has once again (seems to be a theme for the poor guy) lost the woman he loves. Will he be able to focus enough to help out? I’m pretty sure Nathan fans will be crying often this season watching him try and bring Audrey back. One of the things I have read and heard about this season is that focus will return to the main characters and that’s great! The characters and their relationships with each other is a HUGE part of why I watch the show. Now there’s one other important thing to talk about. Ratings. This year Haven is airing Thursday at 10|9c on Syfy. This is a big change from the usual Friday night airing. According to TV Guide’s Fall Viewer’s Guide, Haven will not be up against Scandal so we can relax on that front. But we are up against football, Elementary, How to Get Away With Murder, and Parenthood. This is a big deal. Just because Haven has a super-sized season does not mean it is guaranteed to end after 26 episodes. There is still a chance for the show to be renewed but it all depends on viewership. As fans the best way to tell a network, you want a show to return is to watch the show live. Watch Haven live and get your friends to watch as well. Get new fans hooked on the show. 🙂 The odds may be against us but I remember when folks thought the odds of renewal were against us as well so hang in there. Less than 10 days and counting to see these beautiful faces. 🙂 What do you guys think? Let me know below or find me on Twitter.